What does identity mean to you and how is it defined? Is it defined by your gender, age, sexual preference, educational and professional qualifications/roles, your personal beliefs or causes you might advocate for or the many hats you wear during the course of a day? Is it a combination of all of the above – a multidimensional one or does it not comprise of any of the above? It might even be a particular way in which you view yourself and the way in which you would like the society to view yourself. 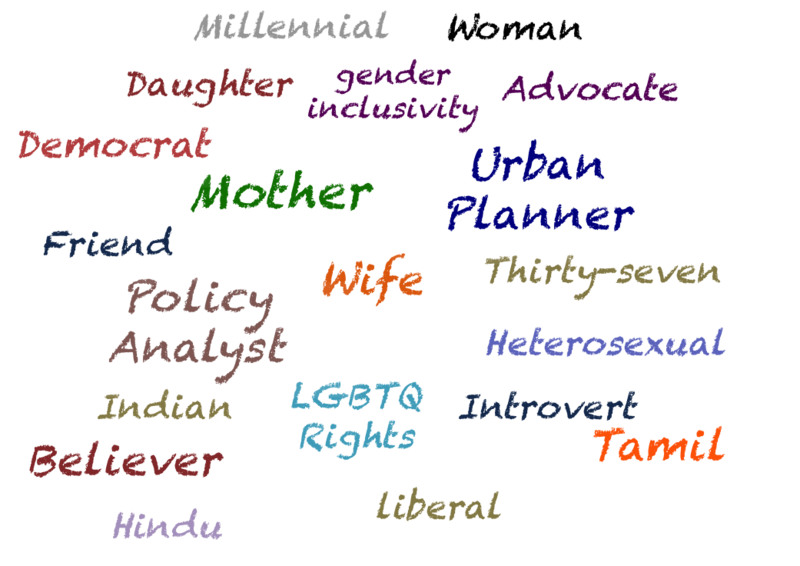 For instance, the graphic above is all the various facets of my identity – a mix / a combination of all of these and if you notice closely, the language I speak, my beliefs and the issues I am passionate about and the ones I got through my parents such as my gender, my language, my nationality, and lest I forget – religion and class makes up this hodgepodge. Now I know what many of you are thinking: where you are going with this girl? Is it not enough that you have signed up for a grad school, now why do you have to go and confuse yourself with a quest for your identity? As if your life is not complicated enough 🙂 Well, let me give you a little background and maybe then it will be clear. We are all referring to identity as a picture of how we view ourselves and most of them seem like choices one makes but what if my identity is based on the social (and sometimes) economic class I was born. Or how if I am undergoing hardship just cos of my fixed identity – say my nationality? I had no say in this identity but now I am stuck with it? How about if I do not want this identity? How do I get out? Or what if I do not want ANY identity? Can you imagine the silence in the room then? I mean, we all realize at some level the difficulties that one undergoes based on nationality, religion or class. But how many of us ever thought about not wanting to be identified based on our nationality or class or religion? Yes, there are definitely a handful when compared to our fathers and forefathers but it is still not a lot when you look at it in a social context. For instance, yes I have faced difficulties due to my gender and the many gender-specific roles that come with it. But there is no way to not want this identity. For instance, I cannot NOT want to be a woman. Now imagine the same when you are identified with a certain class or belief system. How you choose to show up in the world despite all these self-impositions (or oppressions) and how you choose to view the “other” ? Well I do hope I get a plausible understanding of this question in these 2 years here at Heller. But in the meantime, let me know if you have any thoughts or theories that might help answer these burning questions. I leave you with this quote from Simone de Beauvoir, a writer and philosopher and her thoughts on the “other”gender – how the society views women as the “other”of man. That women are viewed as the “other”itself is incomprehensible. Imagine how it will be when you add the layers of race, religion, class and ethnicity. Previous The Observer becomes the Observed! Next Happy Diwali 2015 ….இனிய தீபாவளி நல்வாழ்த்துக்கள்!! !